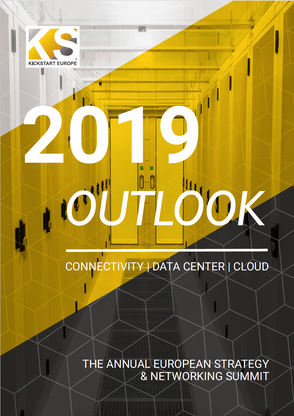 ​This 2019 Outlook report was published at the Strategy and Networking Summit KickStart Europe 2019 on trends and investments in connectivity, cloud & data center, held on January 14-15 at the Amsterdam RAI. Fill in the information below to download the KickStart Europe Outlook 2019 report for free. More information about how we manage your personal data, please see our privacy statement. In the report the key growth indicators for the European data center, cloud and connectivity industries are presented. Developments that drive this growth include Artificial Intelligence (AI), Cloud and Internet of Things (IoT). The number of connected devices, the explosive growth in IP traffic and the ever-growing amount of data are increasing the demand for edge computing, larger data center hubs and hyperscalers. There are many challenges that need to be addressed to be able to support the demand for digital infrastructure and related services, including data centers. Stijn Grove, director of Digital Gateway to Europe, the organization that promotes the Netherlands as digital hub: "In addition to the pressure on technical requirements such as ever lower latencies, distributed computing (Edge) and stricter security, there are simultaneously major challenges in the areas of legislation, privacy, education & personnel, sustainability and energy. The growth of the industry has consequences for the electricity grid and there is a huge need in the coming years for technical personnel to design, build and run applications, data centres and networks.